This Ford Mud Flap is a Drill-less Mudflap, approximately 12 inches wide by 3/8 inch thick, designed to hang approximately 6 inches below the fender-well on a 2WD and 9 inches below the fender-well on a 4X4. Application: FRONT of all 1999 thru 2007 full-size pickups including 4WD. This Ford F250 – F350 Mud Flap is a Drill-less Mudflap, approximately 12 inches wide by 3/8 inch thick, designed to hang approximately 9 inches below the fender-well. Application: FRONT of all 2 wheel drive 2008 thru 2010 full-size pickups. This F250/350 Mudflap is a Drill-less Mudflap, approximately 12 inches wide by 3/8 inch thick, designed to hang approximately 11 inches below the fender well. Application: FRONT of all 2008 thru 2010 full-size pickups with slight lift, or those wanting additional protection further back. Mounting: DuraFlap mounting hardware is made of stainless steel where available. Other mounting products are made of anti-corrosive and rust resistant materials. Our drill-less Mudflaps are custom designed to utilize existing factory holes and other mounting points available on your truck.. These Ford Mud Flaps are a Drill-less Mudflap, approximately 14 inches wide by 3/8 inch thick, designed to hang approximately 11 inches below the fender well. Application: FRONT of all 2008 thru 2010 full-size pickups with slight lift, or those wanting additional protection further back; with tires that measure more than 11.5″ wide. This Ford Mud Flap is a Drill-less Mudflap, approximately 14 inches wide by 3/8 inch thick, designed to hang approximately 6 inches below the fender-well on a 2WD and 9 inches below the fender-well on a 4X4. Application: FONT of all 1999 thru 2007 full size pickups with wider tires including 4WD. This Ford Mudflap is a Drill-less Mudflap, approximately 14 inches wide by 3/8 inch thick, designed to hang approximately 11 inches below the fender well. Application: FRONT of all 1999-2007 full size pickups with slight lift, or those wanting additional protection further back; with tires that measure more than 11.5″ wide. This Ford F450 Mud Flap is a Drill-less Mud flap, approximately 12 inches wide by 3/8 inch thick, designed to hang approximately 9 inches below the fender-well. Application: FRONT of all 2017 thru current F450 Pickups. Mounting: Duraflap mounting hardware is custom made to be used on the Ford Aluminum body truck. Our drill-less Mudflaps are custom designed to utilize existing factory holes and other mounting points available on your truck. This Ford Mud flap is a Drill-less installation, approximately 12 inches wide by 3/8 inch thick, designed to hang approximately 11 inches below the fender-well. Application: FRONT of all 2017 thru current F450 Pickups wanting extra protection for the fat fender wells in the back. This F450 Mud flap is a drill-less installation, approximately 12 inches wide by 3/8 inch thick, designed to hang approximately 9 inches below the fender-well. Application: FRONT of all 2011 thru 2016 F450 Pickups. This Mud Flap for F450 is a Drill-less Ford Mudflap, approximately 12 inches wide by 3/8 inch thick, designed to hang approximately 9 inches below the fender-well. Application: FRONT of all 2008 thru 2010 450 & 550 Pickups. This F-450 Mud Flap is a Drill-less Mudflap approximately 14 inches wide by 3/8 inch thick, designed to hang approximately 9 inches below the fender-well. Application: FRONT of all 2017 thru current 450 & 550 trucks for those wanting extra protection down the side . This F450 Mud Flap Drill-less Mudflap is approximately 14 inches wide by 3/8 inch thick, designed to hang approximately 11 inches below the fender-well. Application: FRONT of all 2017 thru current 450 & 550 trucks for those wanting extra protection down the side, with a slight lift. This F450 Mud Flap is a Drill-less Ford Mud flap, approximately 14 inches wide by 3/8 inch thick, designed to hang approximately 9 inches below the fender well. Application: FRONT of all 2011 thru 2016 F450 Pickups, that want extra protection down the side of the truck, or those with taller tires. Mounting: DuraFlap mounting hardware is made of stainless steel where available. Other mounting products are made of anti-corrosive and rust resistant materials. Our drill-less Mud flaps are custom designed to utilize existing factory holes and other mounting points available on your truck. This F 450 Mud Flap is a Drill-less Mudflap approximately 14 inches wide by 3/8 inch thick, designed to hang approximately 11 inches below the fender-well. Application: FRONT of all 2011 thru 2016 450 & 550 trucks for those wanting extra protection down the side, with a slight lift. This is a Drill-less Mudflap, approximately 20 inches wide by 3/8 inch thick; designed to hang approximately 13 inches below the fenderwell. Application: REAR of all 4WD Dually trucks 2011 – 2016. Serviceability: Maximum protection for 4WD dually trucks and towables. This Mudflap is pre-drilled and requires no drilling of additional holes in your truck. Allows for easy & precise alignment, and drill-less installation. This Mud Flap for a Ford Dually is a Drill-less Mudflap, approximately 20 inches wide by 3/8 inch thick; designed to hang approximately 13 inches below the fender-well. Application: REAR of all 4WD F350 Dually trucks 1999 thru 2010, and REAR of all F450 2008 thru 2010, if this length leaves the mud flap at least 6″ off the ground. Serviceability: Maximum protection for non-stock 4WD dually trucks and towables. This Mudflap is pre-drilled and requires no drilling of additional holes in your truck. Allows for easy & precise alignment, and drill-less installation. These Mud Flaps for Ford are Drill-less Mud flaps, approximately 20 inches wide by 3/8 inch thick; designed to hang approximately 9 inches below the fender-well. Application: REAR of all Ford Dually 2WD trucks 1999 – 2010. Also fits the F450/550 2008-2010 if the shorter length is required to stay 6″ off the ground. Serviceability: For 2WD dually drivers who demand the maximum in protection for both their truck and towables. This Mudflap is pre-drilled and requires no drilling of additional holes in your truck. Allows for easy & precise alignment, and drill-less installation. This Mud Flap for Ford is a Drill-less Mud flap, It is approximately 12 inches wide by 3/8 inch thick. It is designed to hang approximately 11.5 inches below the fender-well. Application: FRONT of all 2017 thru Current full size pickups. Mounting: Duraflap mounting hardware is custom made to be used on the Ford Aluminum body truck. Our drill-less Mudflaps are custom designed to use existing factory holes and other mounting points available on your truck. Serviceability: This Mudflap is pre-drilled and requires no drilling of additional holes in your truck. It allows for easy & precise alignment, and drill-less installation. This Ford Mud Flap is a Drill-less Mud flap, approximately 12 inches wide by 3/8 inch thick, designed to hang approximately 13.5 inches below the fender-well. Application: FRONT of all 2017 thru Current full size pickups wanting additional protection further back on the truck; or those with a slight lift. This Ford Mud Flap is a Drill-less Mud flap, approximately 14 inches wide by 3/8 inch thick, designed to hang approximately 11.5 inches below the fender-well. Application: FRONT of all 2017 thru Current full size pickups with over-sized tires that require more coverage than what the standard mud flaps will provide. Mounting: Duraflap mounting hardware is made of stainless steel where allowed and aluminum where necessary. Other mounting products are made of anti-corrosive and rust resistant materials. Our drill-less Mudflaps are custom designed to utilize existing factory holes and other mounting points available on your truck. This Ford Mud Flap is a Drill-less Mud flap, approximately 14 inches wide by 3/8 inch thick, designed to hang approximately 13.5 inches below the fender-well. Application: FRONT of all 2017 thru Current full size pickups with oversized tires requiring more coverage than the standard size will give, and wanting additional protection further back on the truck; or those with a slight lift. This Ford Mud flap is a Drill-less Mud flap, approximately 12 inches wide by 3/8 inch thick, designed to hang approximately 10 inches below the fender-well. Application: FRONT of all 2011 thru 2016 full size pickups. 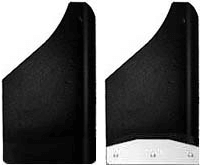 These are Drill-less Mud flaps for Ford, approximately 20 inches wide by 3/8 inch thick; designed to hang approximately 15 inches below the fender well. Application: REAR of all 4×4 Dually trucks 2017 thru Current. Gives great protection for a boat or trailer but leaves more ground clearance for those worried about backing up against taller obstacles. These fit the F450-550 and 650 as well. Those wanting maximum protection should order the FR20L 17 style. Mounting: Duraflap mounting hardware is custom made to be used on the Ford Aluminum body truck. Our drill-less Mudflaps are custom designed to utilize existing factory holes and other mounting points available on your truck. Mudflaps are custom designed to utilize existing factory holes and other mounting points available on your truck. Serviceability: Excellent protection available for 4WD dually trucks and towables. This Mudflap is pre-drilled and requires no drilling of additional holes in your truck. Allows for easy & precise alignment, and drill-less installation.